Since the band began in the early 1990s, Morbosidad has remained one of the most consistent bands in the Bestial Black/Death scene. 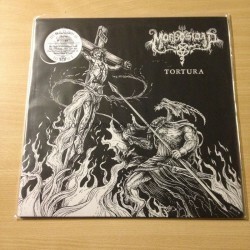 As one of the very few bands that has maintained the extremity in their sound throughout the decades, Morbosidad has assumed a deservedly prominent status within the ranks of the underground. Led by vocalist Tomas Stench, whose depraved vision guides the band and whose distinctive vocal style is the signature of all Morbosidad releases, Morbosidad has evolved through the years without sacrificing their integrity. After relocating to Texas several years ago, Tomas Stench began working a new set of musicians. The current incarnation of the band is comprised of veteran musicians whose skill and precision serves to enhance the impact of the band’s style. While still retaining the bestial sound for which the band has long been recognized, the new material featured on this MLP, “Tortura,” is decidedly more Death Metal oriented and, as such, more focused and powerful. The instruments all merge in lock-step fashion while Stench delivers his lyrics, as always written predominantly in Spanish, in his typically staccato manner, each word resonating with guttural evil. The effect is one of relentless attack – a frenzy of insane violence as can only be summoned by Morbosidad. One of the most noteworthy aspects of this EP is the guest appearance of the inimitable Chris Reifert on the closing track of the record. Reifert has long supported Morbosidad and this appearance marks the first time he and Stench have had the opportunity to collaborate.